We love hearing from our members! Share your Penn East FCU story here. We regularly use feedback from our members to helps us with products, services and marketing. Your opinion is very important to us. Thank you for your help! I give permission for Penn East FCU to use my experience as a Testimonial. 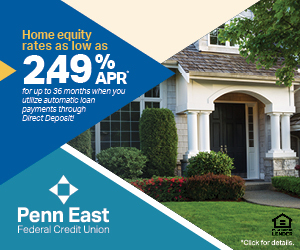 All submissions become property of Penn East FCU and we reserve the right to alter/correct information as it pertains to Penn East FCU's products, services, etc.